Eight days ago (on March 29), the ultra-conservative Dean of the Montpellier University Law School was summoned to police headquarters, interrogated, hauled into court, and held over in jail for arraignment by the Chief Prosecutor – all on the complaint of nine student strikers, who claim to have been brutally assaulted with Dean Philippe Pétel’s active complicity while ‘occupying’ a school auditorium. The students, backed by live videos, described Dean Pétel encouraging masked thugs with wooden staves to burst into a Law School auditorium and violently expel a few dozen students who were ‘occupying’ it as part of the University-wide student strike. The thugs were videoed brutally beating students, even on the ground, and several were injured. The thugs then returned to the antechamber, where a counter-demonstration of conservative anti-strike law students including Pétel and several other faculty, was waiting. The Dean was videoed congratulating the bulked-out masked aggressors, whom no one was able to identify as students. The building was locked, but Pétel had the key to the antechamber from which the attackers issued. The complicity of other faculty members present is under police examination, and one has been arrested. Within hours, the Law School attacks were all over the social networks, and student strikers, human rights groups, civil rights lawyers were busy organizing demonstrations and protests for the next day, framing it as a ‘fascist aggression’. 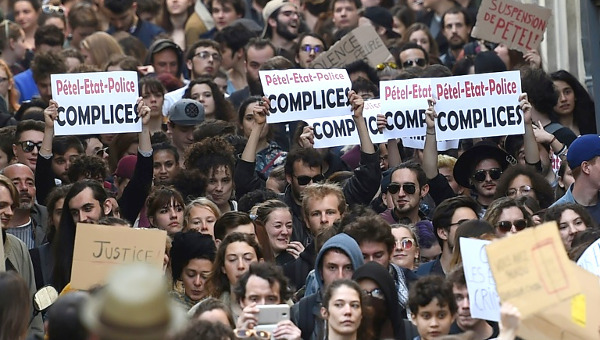 This epithet is less of an exaggeration than it may seem, as the tradition of law students supplying the thuggish muscle for extreme-right groups here in France goes back for over a century (as I recall from my student days in Paris opposing the Algerian War). As we all know, student striker complaints of police brutality normally go unheeded, and protests against them may bring down even more police punishment. Deans who ‘stand firm’ against occupiers get promoted. How then to explain this ‘man bites dog’ reversal in Montpellier University (founded 1279)? 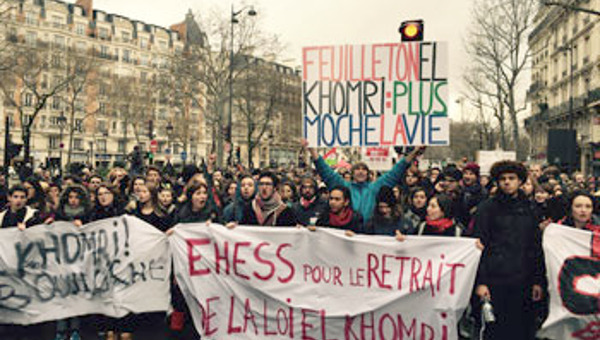 Today in France, twelve universities are already on strike, and the social and labour situation is heating up rapidly. Here in Montpellier, Université Paul Valéry, the Liberal Arts University, just voted an open-ended strike and blockade of classes at an outdoor General Assembly attended by over 2,000 students. So far, the mood has been temperate. Support for the strike is near unanimous, but there is deep division over the tactic of blocking classes, especially among first-year students who are worried about their exams (which will probably now be put off). Some professors are offering their courses online and a radical ‘free university’ called “Vincennes2.0” in memory of Paris in May 1968 has been set up. The local high schools are also full of agitation, with two or three ‘on strike’ and riot cops hanging around and making arrests. The situation is tense. The paradox in this story is not the Dean Pétel’s more-or-less traditional role in the attack,1 but the Prosecutor’s outlandish decision to hold a venerable Law Dean in the clink. To be sure, Pétel, a youngish cocksure neo-conservative, was ‘asking for it.’ He at first openly bragged of his role, oblivious to circumstances and the consequences, and made the national TV news and the front page of the big Paris papers. But my guess is that the order to lock him up came from Paris. In centralized, hierarchical France the Prosecutor answers to the Prefect who answers to the Minister of Justice who answers to the President. President Emmanuel Macron, who has laid down a major long-term challenge to both the students and public service workers, wants to push through his reforms as quickly and as smoothly as possible. The social situation is heating up, and Macron is too smart to polarize the situation further and waste political capital on a far-right loser. He also wants to be seen as impartial and as willing to strike his enemies on the Right as on the Left (as he no doubt will when the student and worker struggles really heat up). The immediate issue for the university students is President Macron’s educational ‘reform’, which like all of his ‘reforms’ will be imposed by administrative decree, rather than through the legislative process (which normally includes lengthy discussion and amendments). Macron seems to prefer ruling by decree, although he has a solid majority of followers in the National Assembly, having split and evinced the parties of both the Left and the Right. All his moves seem carefully timed, and perhaps he fears delay. Macron prefers the ‘fast track’ method, and his authoritarian, technocratic style definitely pisses off many French people, but especially “the people,” who have long been fed up and are suffering cutbacks while the super-rich get subsidies (sound familiar?). Macron has already pissed off France schoolteachers, on whom he is imposing – without discussion – yet another new K-12 national curriculum so confusing that nobody can figure out how to implement it. Meanwhile classes are huge (35 students), young people are getting harder and harder to teach, and support for teaching, supplies etc. is being cut way back. At the university level, the goal of Macron’s reform is to introduce “selection” in university admissions, which traditionally have been open to all who have earned the classical Baccalaureat diploma and the end of secondary school (just like the New York City colleges a generation ago). France now has five million students, and thanks to constant cutbacks, there aren’t enough places for about 20 per cent of the incoming class. Hence the creation of ‘competition’ and U.S.-style admissions offices at each school. Moreover, although all French universities are under the administration of the national Ministry of Education, Macron wants to make them ‘competitive’ with each other, like in the USA. So some schools will be ‘easier’ to get into, but their degrees will be ‘worth’ less. Both these ‘reforms’ are obviously unfavorable to underpriviledged students, and favorable to the privileged. They are by definition ‘unpopular’. Macron has also laid down the gauntlet to public service workers including to the venerable CGT railway workers union whose militancy is legendary. 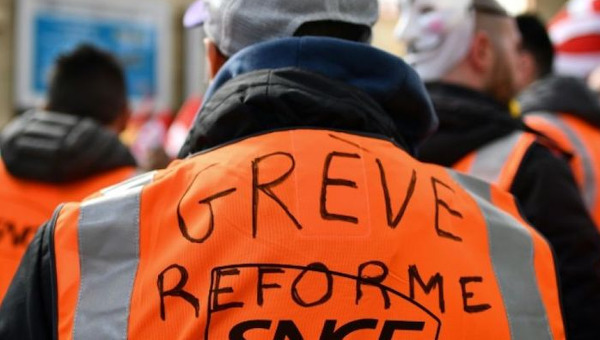 Last Spring, despite militant protests, Macron succeeded in pushing through, by decree, his reformed Labour Code, taking away seniority rights and legal protections enjoyed by private sector workers and making it easier and cheaper for bosses to fire them. This Spring, instead of relying on the traditional divide-and-rule precept, Macron proposes to take on both the five million students and the five million public sector workers (about 20 per cent of the total labour force) together. He may have bit off more than he can chew, especially with the general population in a hostile anti-government mood and ready to support these popular struggles. 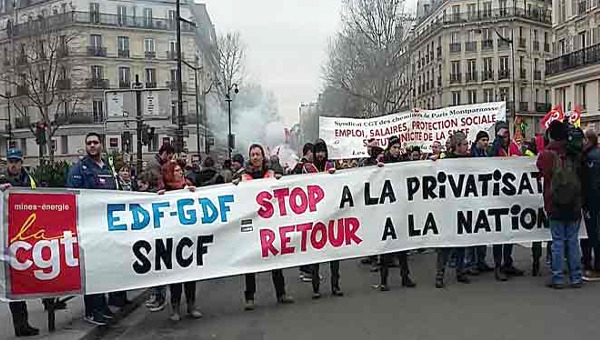 For in attacking the public sector workers’ alleged ‘privileges’ and proposing to dismiss them in large numbers, Macron is effectively attacking precious, popular public services which are used by the large numbers among the popular classes. Trains, subways, hospitals, social services, public offices, roads, etc. These services have all been subject to cutbacks, which make life harder and lines longer for regular folk, and now it is obvious to all that Macron is downgrading them in preparation for privatizing them to sell-off cheap to corporations, as has already happened to the French Electric Company, the French Gas Company and to most of the French Post Office. They fear he will privatize the SNCF French railroad as Margaret Thatcher, his spiritual guide, did to British Rail (which is now expensive, dangerous and mostly late). 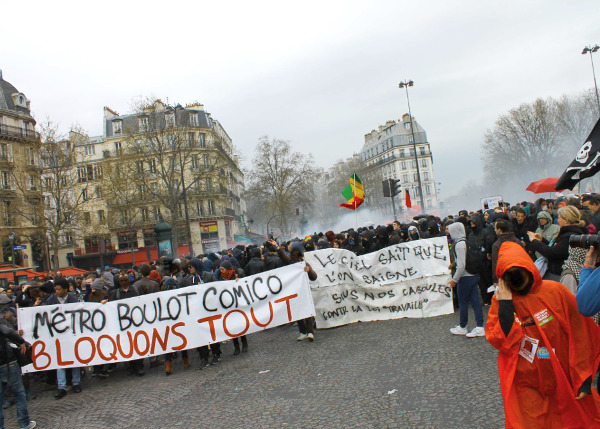 The social struggle got off to a militant start last week on March 22 (also the date of the attack on the Montpellier Law School occupiers) with 180 demonstrations by students and public workers across France. Air flights were down by 30 per cent. Over 5,000 railway workers from all over converged on Paris, held a march during which they set off loud industrial firecrackers, and then conducted a spontaneous mass General Assembly where they pledge to go beyond the announced schedule of staggered strikes planned by officials of the three railroad unions, beginning April 3. The day began with a huge morning demonstration of students converging from all over the Paris regions. The students then joined up with thousands of various public service workers demonstrating under their union banners, and this demonstration ultimately merged with the railroad workers. Hundreds of thousands are said to have been in the streets. Remarkable, too, were the spontaneous actions of autonomous groups known as “March-Headers” (Tête de cortège) who come together at the very front of the legal, planned, well-organized and policed demonstrations with the aim of breaking the mass movement out of the routine of being led around like sheep by union organizers, subjected to prescribed slogans on signs and loudspeakers, and then sent home without being allowed to express themselves. Their goal is to bring together students and workers, younger and older people, workers from different sectors and to encourage discussion and self-organization. Many of these activists, young and old, are veterans of the struggles of 2016 and 2017, recognize each other today, are forming networks and have experience in self-organization. Although they are also characterized as “black-blockers,” whose role has often been divisive and provocative, the March-Headers movement seems to me promising in its push to open up political space for anti-government, anti-system demonstrators to come together, exchange ideas, build relationships and learn self-organization through direct action. Heretofore, big official protest movements in France have been kept separate, divided into interest groups, and regimented by union officials whose basic tactic has been to space out useless, symbolic one-day national mass mobilization until people got tired, summer vacation arrived and the government won. To be sure, spontaneous (and sometimes violent) wildcat movements have often broken out of this straightjacket. But today’s students, union members and others are much more open to coming together spontaneously and to linking through social media. Fifty years ago, in 1968, the highpoint of the French May Revolt was the conjuncture of the student movements occupying the universities and the organized working class occupying the factories under the discipline of the Communist CGT and other unions: the “student-worker uprising,” as it came to be known. But to those who lived it, the conjuncture never quite jelled, as the union leaderships mostly kept the workers barricaded inside the occupied factories, and their student supports outside, minimizing contact and exchange. A big disappointment, as recalled by a number of 1968 activists questioned by Mitchell Abidor in his lively just-published book of interviews May Made Me (PM Press, US; Pluto, GB). Perhaps today’s student and worker activists are ahead of the game and will not let themselves be ‘divided-and-ruled’ like previous generations. Also, today they have the advantage of social media which allows them to bypass the establishment media, get out their information and organize themselves in real time. Here in Montpellier, the movement augers well. The student strikers at Paul Valéry have invited workers, homeless, elders into their assemblies and have received worker support and interest. Their action committees include not just students, but professors and campus workers as well. This is a good start. Moreover, they have harnessed social media to the extent of being well informed about what is happening locally and in touch with other universities. The record number of people that attended the last General Assembly (upto 2,500) is in part attributable to organization through social media (which are sometimes blamed for keeping people at home behind a screen). Ironically, both this first mass demonstration and the Montpellier Law School incident took place on March 22. That date marks the 50th anniversary of the 1968 student occupation of the Administration building of Nanterre University which eventually set off a national general strike that shook de Gaulle’s authoritarian regime and sent the General scurrying to Germany for Army support. Might something similar be in store for Macron’s France today? The public mood is somber, after long years of high unemployment, stagnant wages, neoliberal chipping away of hard-fought social support systems and privatization of social services under Sarkozy (now also on trial!) and the ‘Socialist’ government of François Hollande. Personal recollection: In Hamilton Hall during the first night the April 1968 Columbia Unversity occupation, we were informed that Dean David Truman was making the rounds of the fraternities and dorms, organizing gangs of jocks to drive out the occupiers. 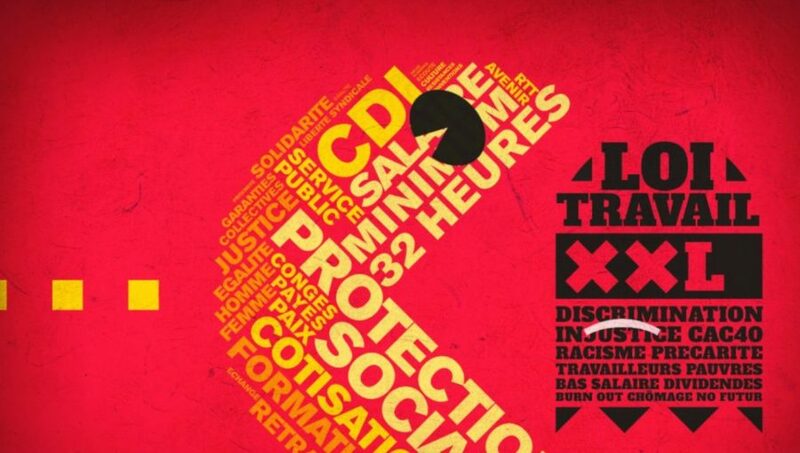 Casualization as a Social Model in France? Definitely No!